Grey Sands is not just a vineyard, it’s a garden too! Owner and vintner Bob Richter has always loved gardening, so much so that he had his first garden at the age of three. Years later, while studying dentistry, he dreamed of having a cool climate nursery in the Dandenongs or a tropical nursery in far north Queensland. Then he met Rita, and everything changed. He was introduced to the world of wine and the more he learned, the more he decided that a cool climate vineyard would be the perfect way to combine his love of growing things with the making of a very agreeable final product. And the coolest area of Australia was of course Tasmania. So Bob and Rita moved south in 1987 to establish a cool climate vineyard modelled on the French vineyards they’d seen in their travels. The land they bought was just grassy paddocks but with weekends spent in the vineyard or garden, the garden and vineyard gradually took shape. Grey Sands Vineyard is dry-grown without the aid of irrigation, meaning it took much longer than normal to come into production. First vintage was over ten years after moving in. It was worth the wait – Grey Sands wines are concentrated and intensely flavoured, with great cellaring potential. The garden meanwhile was planted out in steps. Native windbreaks went in first, then conifer windbreaks, feature trees, larger shrubs and finally garden beds with perennials. Grey Sands opened its doors for Open Gardens Australia for the first time in Spring 2012. Inspired and encouraged by the comments and feedback, Bob and Rita continued to open each Autumn and Spring until Open Gardens Australia ended. They now open on the second weekend of each month through the summer months. 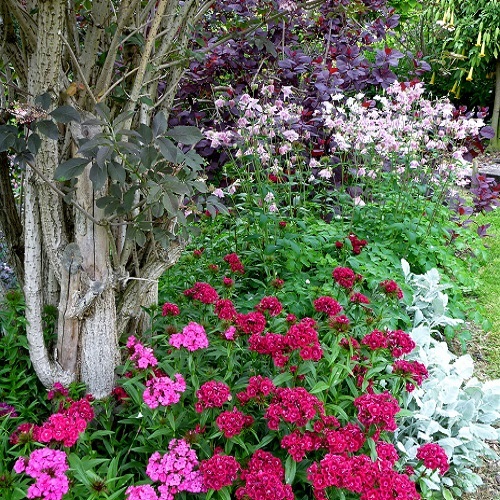 The garden is seasonal and has a large number of unusual conifers, birches, roses, salvias and perennials. Many plants that flower in Spring have glorious coloured foliage in Autumn, and there is something of interest all the time. There’s nothing Bob likes more than to show guests around the garden and answer any plant questions. You’re welcome to BYO picnic on the Festival weekend and enjoy the garden with or without a glass of wine, in one of the idyllic picnic spots. Bring your own picnic blanket, or enjoy the views from the garden tables. There will be a small number of plants and cuttings from the garden for sale too.